Journalists and watch enthusiasts are currently flocking to a usually-sleepy corner of Switzerland for the largest and most impressive watch show in the world - Baselworld 2018. Rolex updated a few of its classic models at Baselworld 2018 - including the GMT Master II. Fans have been calling for a steel GMT Master II with the classic red and blue 'Pepsi' bezel for a while now, and Rolex has listened. Great news for those of us who can't stump up the £20,000+ for the white gold model. The Swiss brand has made welcome changes to the lugs and sides of the case, and fitted it on an attractive five-link Jubilee bracelet. The new GMT-Master II watches are equipped with the new calibre 3285, a next-generation movement with big improvements in precision, power reserve, resistance to shocks and magnetic fields, convenience and reliability. Rolex also introduced a new generation of the Oyster Perpetual Datejust 36, Datejust 31, and Deepsea Sea-Dweller. 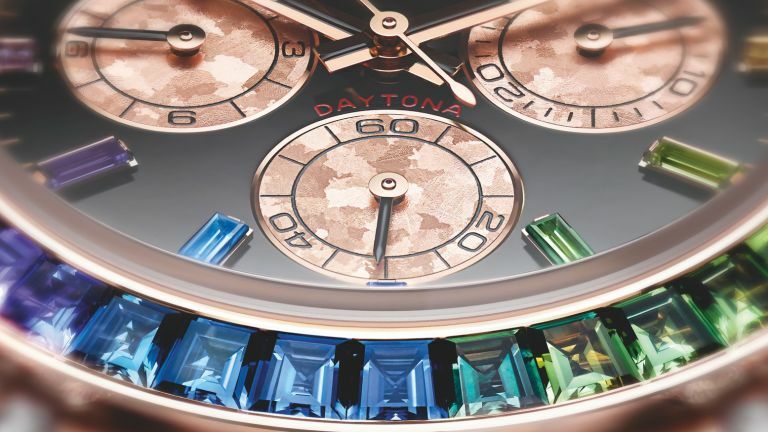 If all of those sound too understated, the watch maker also unveiled an 18 ct Everose gold version of the Cosmograph Daytona, with a bezel set with a gradation of sapphires in rainbow hues, case is adorned with 56 brilliant-cut diamonds, and 11 baguette-cut sapphire hour markers. TAG Heuer took to the stage to unveil a new, modern version of its flagship chronometer, combining two of traditional watchmaking's most famous complications: a tourbillon and a chronograph. TAG Heuer Carrera Chronograph Tourbillon Chronometer, as it's called, looks fantastic with an understated midnight blue ceramic case, complemented by a ceramic bezel and lugs. This colour scheme is carried onto the movement, with elegant touches of blue on the weight and barrel. What really makes this piece special is that it's the first TAG Heuer chronograph to bear the prestigious "Tête de Vipère" stamp of excellence, awarded by the Besançon Observatory. As a result, the "Tête de Vipère" stamp has been applied to the movement, visible through the sapphire crystal of the case back. Only 155 pieces are being released to celebrate 55 years since the Heuer Carrera was first created. As part of the celebration, TAG Heuer also unveiled a new GMT version of the Carrera featuring the Heuer 02 manufacture movement, as well as a revised Carrera Calibre 16 Chronograph (TAG's best selling model). It was love at first sight when we saw this Seamaster 1948 Limited Edition at Baselworld. The original Seamaster was launched in 1948, and became Omega's first family of watches. This limited edition has been released to commemorate the 70th Anniversary of the Seamaster, paying tribute to the brand's post-war classic. This piece oozes retro charm, with a stainless steel case, polished bezel, opaline silvery domed dial and polished crown. The dial is finished off with a small seconds indication at 6 o'clock, as well as leaf-style hour and domed minute hand. As a tribute to the many aviators and mariners who placed their trust in Omega, the flat sapphire crystal caseback of each watch is laser engraved and lacquered by hand with a 70th Anniversary logo, a Chris-Craft boat and Gloster Meteor aircraft. Each model is limited to 1,948 pieces. Omega also added a 42mm model to the Seamaster Diver 300 Collection, and announced a "Dark Side of the Moon" Apollo 8 edition of the Speedmaster, with a striking black and yellow colourway. Tudor's Black Bay range has been tremendously successful, and looking to build on that success Tudor is releasing a more compact model with a 39mm diameter case. Slim wristed people rejoice! It's called the Black Bay Fifty-Eight, named after the year in which Tudor released its first diver's watch, and comes in a new colour combination. It's a subtle variation on the exiting range, but the hour markers, hands and minute track of the black and steel bezel are now finished in gold. They're small touches but we love the vintage aesthetic it creates. The winding crown tube is made from satin-brushed steel, and the crown bears the Tudor rose logo. The Fifty-Eight launches with the Calibre MT5402, the first of Tudor's second family of movements. With its 26 mm diameter, it's been designed for medium-sized watches, and is capable of displaying hour, minute and second functions. Despite its smaller size, you'll still get a 70-hour power reserve, meaning you can take it off on a Friday evening and put it back on again on Monday morning without needing to wind it. Tudor has also released its first GMT model, the Black Bay GMT. The piece sports a distinctive blue and burgundy bezel, managing to retain a strong 'Black Bay' identity, and features a new manufacture movement. The additional time zone is indicated by the red 'snowflake' hand, which spins around the dial in 24 hours. What's the point in having an amazingly intricate watch movement if you can't see it? The new Big Bang Sapphire Tourbillon is completely transparent, everything from the case, to the dial, strap, and tourbillon movement have been given a clear makeover. It represents a breakthrough in the use of sapphire in watch making, and we think it looks absolutely stunning. The crystal mechanics appear to float, while the dial and its numbers, index and power reserve indicator are all opalescent to add some subtle contrast. Hublot also announced a smaller Big Bang Unico, now measuring 42mm, perfect for slimmer wrists, and Big Bang MP-11 in 3D carbon. The MP-11 is reinforced with three-dimensional fibre woven resin, and shaped into a case inspired by a race engine. We love Breitling's new Navitimer 8 B35 Automatic Unitime 43, designed with international travellers in mind with the brand's trademark brash styling. At the heart of this piece is the COSC-certified chronometer is the Breitling Manufacture Caliber B35, which can tell the time in multiple timezones thanks to an independant hour hand. The stunning dial is available in black or silver, held within a 43mm steel case with a rotating bezel comes. You get the option of a steel bracelet, or an alligator leather strap in brown or black. To celebrate the fiftieth birthday of Patek Philippe's classic 'Golden Ellipse', the watch maker has graced this iconic design with rose gold. When it first appeared in 1968, Patek's Golden Ellipse was a bold departure from traditional watch shapes, inspired by the principle of the “golden section”. It was crafted using the 'divine' ratio of 1 / 1.6181. It forms the basis of some of history’s greatest works of art, architecture, and, since 1968, horology. We think this piece has a timeless elegance to it, which is emphasised by the thin 5.9mm case and simple black face. Patak Philippe also added to its sporty watch collections, with with the first perpetual calendar in the Nautilus collection and the first chronograph in the Aquanaut range. Bell & Ross, is, perhaps, the ultimate reference when it comes to professional aviation watches. With its iconic square shape and clean graphic lines, there really is nothing else like it. This year at Baselworld, the brand presents two new pieces, the BR03-94 Horolum and the BR03-92 Horoblack. Their name comes from 'Horo', which is a reference to B&R’s concept using matt micro blasted steel on the boxes and dials for an optimal readability. The Horolum features lashings of ultra-phosphorescent Superluminova C3 on the hands, indexes, and numbers. The colour designed to mimic the lighting on landing strips, and will offer excellent readably at night. The Horoblack features an identical design, but replaces the lume with black paint. We think this bold monochromatic colourway looks fantastic. The Horoblack is limited to 999 pieces, while Horolum is limited to just 500 pieces. The Bell & Ross BR V1-92 Racing Bird and BR V2-94 Racing Bird Chronograph are also being unveiled at Baselworld, designed as companions to the BR-Bird racing plane concept. Nomos Glashütte presented a new sporty automatic watch at Baselworld 2018 drawing inspiration from a car's speedometer. Its name? The Autobahn of course! The piece uses Nomos' new neomatik date caliber (DUW 6101), and looks distinctive at 41mm in diameter. Its design makes reference to the mechanism beneath, with the date ring running along the outer edge, show off with an elongated date window way down at six o’clock. “I love speed,” says the designer, Werner Aisslinger, whose work can be found in the New York Museum of Modern Art (MoMA), the Fonds national d’art contemporain in Paris, and the Victoria & Albert Museum in London. Nomos also released 'Tetra Petit Four', four square a watches in spring colours, and added the neomatik date movement to its existing Tangente, Orion, and Ludwig models. Three years since the launch of Mondaine’s first horologically-styled hybrid smartwatch, Mondaine has released a successor - meet the new Mondaine Helvetica Regular Smartwatch. Whilst the design is in-keeping with Mondaine's existing line up, the technology has advanced even further. The new hybrid watch uses a 281 module technology created in collaboration with MMT, allowing it to easily sync with an iOS or Android phone through the MMT-365 app. The new watch adds the ability to receive Call & Email Notifications, in addition to the existing model's ability to track daily Activity and monitor sleep. It looks great, and beats many of its competitors with an impressive 2 years battery life. Zenith's Defy range is quickly becoming the brand's flagship collection, and the watch maker has added two more models at Baselworld 2018. This highlight? A watch which literally defies the laws of gravity – the Defy Zero G.
How exactly does it work? The piece features a downsized and optimised gyroscopic “Gravity Control” module, which cancels the effects of gravity on the running rate of the watch, by maintaining the regulating organ and the balance wheel in a horizontal position. The Zenith also looks great, with a skeletonised face in a sturdy 44mm diameter case, available in titanium or pink gold. Zenith also announced a more entry level model in the Defy range, the Defy Classic. Carl F. Bucherer has unveiled the Manero Tourbillon Double Peripheral at Baselworld 2018. We love the understated elegance of this piece, which hides the state-of-the-art technology underneath the dial. The COSC-certified chronometer timepiece is equipped with the innovative CFB T3000 manufacture caliber, featuring a peripheral automatic winding system and a peripherally mounted tourbillon. Carl F. Bucherer was the first watch manufacturer ever to put into series production. We love the bold placement of the tourbillon, floating prominently at 12 o’clock. The peripheral rotor that powers the watch revolves around the edges, providing an unhindered view of the high-quality movement. Oris has revived a heritage design with its new Big Crown Pointer Date collection. First released in the 1980s, the design marked a watershed moment for the company when it was reintroduced to champion the eternal value of mechanical watchmaking in the face of the quartz revolution. The new models feature a reworked the case, both slimmer, smoother and more seamless so that it slips elegantly onto the wrist and under a cuff. Kronaby had plenty of new pieces to show at Baselworld, with new models in the Apex, Sekel, and Nord collections. Each watch features Kronaby’s unique Connected Movement, with the ability to filter notifications, automatically set the time zone, set a silent alarm, track steps, control music, take a pictureCamera remote and start a timer. All of those features can be set up in the attractive companion app. T3's pick of the new selection is the Nord (pictured above), with it's classic Scandinavian design. It features a 41mm stainless steel 316L case and a waxed suede leather straps completes the look. The RRP is €295 (around £260), and is available from April 2018.